Press E to use objects. Press i to access inventory. You can click an inventory item to equip it (makes it active item). Press spacebar to use the active item (ie, use sword). Use the sword on enemies to get cash to spend in the shop (press H to access shop). /who - see who is online. /trade <username> - start trade with someone. /w <player name> <message> - Sends a private whisper message to player name. /rewardblocks - see your progress on finding reward blocks. /me <text here> - emotes this text as an action. /sellallinv - sell all your inventory items. /leveldoor <minimum level> - set minimum level for a level door. /townvicemayor <player name> - (Mayor Only) Toggle's citizen vice mayor status. /townpvp (off OR on OR bounty OR dungeon) - (Mayor/Official/Vice Mayor only) Toggle PvP status of town. /towns - Show list of all towns on this server that you are the mayor of, and their location. /buypocket - purchases a new pocket universe for 10p. Pocket will be a standard new pocket (2x2 regions big with no townstone placed yet). /passworddoor open <password> - Opens password door. /passworddoor set <password> - (Owner only) Sets password. How do I get a log file to get more information about my error? My bet is on the antivirus, but try each. Good luck! If in your log file, this manifests as the line “[WARNING] We had to give up waiting for steam auth ticket to be ready” in your game log, this indicates that Steam's Auth servers are currently down. Please retry later. If you are running the Steam build, please make sure Steam is actually running and you are logged in. Disable antivirus / parental controls (some have been causing the steam auth DLL's to not load) and try running again. Ensure game is not currently running. 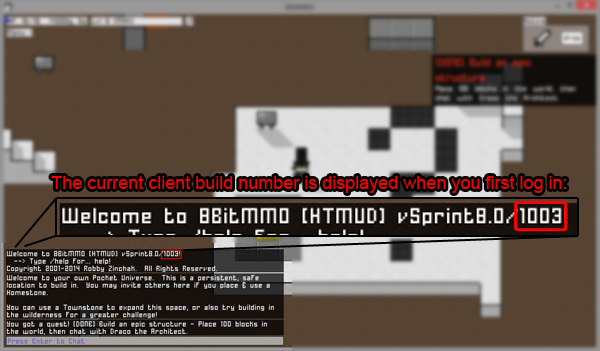 Then in Steam, right click 8BitMMO -> Properties. Choose Local Files tab. Click Verify Integrity of Game Cache. Try running the game again after this is complete. Could not copy steam dlls. Ensure your user has permission to C:\Users\<username>\AppData\Roaming\8BitMMO and its subfolders -- simplest way is to add permission for all users to modify that folder. "Oops! A download error occurred"
Where is my plat credited for purchases? Plat is a universal currency, accessible from all servers. Where are my gold & hats credited for in-game pack purchases? Gold & Hats are server-specific, and credited to the server you are playing on when you make the purchase (or if not online, then the one most recently connected to). They are credited instantly, as long as you complete the Steam purchase. Where are my gold & hats credited for Steam Founder's Pack purchases? Gold & Hats are server-specific. They are credited when the launcher is first started up. They will be delivered to the last server you played on prior to restarting the launcher. How do I wear my Steam Founder Hat(s)? This can happen when certain overlays interfere with the game. Try turning off Mumble Overlay, teamspeak overlays, or anything else that would interfere with rendering. "Error: Trouble getting latest launcher version online." Try closing the launcher and run the game again - maybe it was a temporary error. This error will also be shown when Steam API servers are down. Can I make a YouTube let's play video? A) Please keep in mind the game is still a work in progress - you might find bugs, and I still plan on adding more content and features to the game. B) You can monetize the video with ads. But if you're able to avoid it, I'd very much appreciate if you didn't. I do want YouTube Let's Play Broadcasters to be successful and to earn a fair wage for their work -- I love what you guys do. But I also loathe advertising with the passion of a thousand suns. So if you can skip the ads, awesome, but if you have to put them in, then that's okay too. You need to disable Windows Parental Controls in order to play. You need to disable Microsoft Family Safety in order to play. Try updating your network drivers, especially if you have an Alienware Laptop. Details. UPDATE: There is now a native 64bit client -- these steps should no longer be necessary. ERROR: ld.so: object '/home/user/.local/share/Steam/ubuntu12_64/gameoverlayrenderer.so' from LD_PRELOAD cannot be preloaded (wrong ELF class: ELFCLASS64): ignored. Don't worry -- 64-bit Ubuntu just requires some additional libraries. The game should now launch okay. How do I become a Game Moderator? Be recommended by one of the current Game Moderators. Generally to be eligible, you need to be consistently active for several months, and have demonstrated a history of helping new players. Please install Java from Java.com. You'll want to use the latest version of Sun Java 6. Java 7 is currently in developer preview, and doesn't consistently work with the game yet. Try a reboot, especially if you just installed java, or changed java versions. This has helped in at least one case and saved hours of troubleshooting. Please make sure you have installed the latest Java 6 available. Java 7 should also work (no guarantees on that yet though). On Windows, head over to Java.com to get the latest version. On Mac this can be tricky, but try this video tutorial and let me know if that works. For Linux, please consult the documentation for your distro on how to install/get the latest Java. It says my Game Client is old and I need to clear my cache? Try clearing your browser cache & restarting your browser. Failing that, try a full system reboot. Try the steps above for weird Java issues. Most likely you need to restart your browser or task kill any java instances (CTRL + SHIFT + ESC) and refresh the page. I just joined the game, how do I get out of this room? Check the quests window to see your next steps -- it's on the right of the screen. Menu > Quests to see it if you closed it previously. How do I open doors / talk to NPCs? Press E while standing near them. I lost my sword somehow! Go to Menu > Shop, and buy a new sword. If you're out of gold somehow, ask someone to give you a sword. Help, what do I do now? Check your quests window on the right to see your next steps. Talk to the NPCs at the spawn point to get quests. How do I build? How do I place blocks? Talk to Draco at the spawn point. He'll give you a bunch of quests that'll teach you step by step how to build. Where do I slay LawyerCats / where is the wild areas I can build in? Take the wildepad telepad at the top right of root to teleport to a random area on the edge of the wilderness. You are now in your own Pocket Universe! Have fun building! Awesome! read the HOWTO, or watch the vlog. I want to join a town! Why can I sometimes steal grass? Light green grass is artificial grass - it is owned, and cannot be griefed. Grass bought from the shop is this artificial / protected grass. I am going to steal all the grass! 2013 UPDATE: People took all the grass, and now the 'free' grass is incredibly valuable to trade to other players due to its rarity. Hah! Please post it in the suggestion box so I can keep track of it! How do I write on a sign? Type /sign blah in the chat window while standing near it. Talk to Draco nearing the spawning point to learn more. Hard answer: If you type /loc it will list your position. IE, it'll show something like '128,128,128:2,3=65'. The part in bold, between the : and the = is the most important part. These are your region coordinates and indicate what x,y chunk of the world you are in. You start the game roughly at 0,0, and as you move east/right the x value gets bigger. As you move south/down, the y value gets bigger. If you forgot where you placed your items, launch the map via Menu > Map. From there, click "Where's My Stuff?" I'm having random lag spikes / anything I can do to help performance? Try toggling off lighting in Menu > Options (or just press T). You can also toggle off all heavy processing with SHIFT+T, at the loss of lighting & outlining. If your lag is network related, try turning off bittorrent, or any other heavy network utilization programs. Type /color <number> in the chat window, where number is between 1-9. What client build am I running? How do I get the latest client build? Steam or Desktop Edition: Simply join a server from the launcher -- your client will be checked to ensure it is the latest version. Kongregate or Browser Edition: Restart your browser -- if that fails to get the latest version, clear your browser's cache, then perform a full system restart. Why is there no jump key? Jumping with swords is dangerous. Check this page for links to forums & the support system. Just fyi, OpenJDK v1.6.0.0 (the runtime) and IcedTea-web v1.2 (the browser plugin) work fine for me on Fedora. Of course, ymmv depending on the version and any down-stream patches that have been applied. It’s generally been pretty solid for me though, and it’s been improving gradually. I have some problems whit Java. I have Java,but I can’t play the game. I saw the FAQ so much times but I not see what is the solution for my problem. Hello … i actually have a problem, every time i click “Click here to play! its free” It just closes and opens again the Tab, if i click it again it closes and opens again and sometimes it just gets a error and does not go back to the main page. I must change of Browser or something…? How do you get HP back? Currently there is no way to do so other than death, but I am planning in the future. what in the world are ya talkin about??!! how to post on signs? how do you get platinum besides kreds? Platinum is a purchase-only currency to support the cost of development, although some players will trade platinum-costing items in exchange for gold. I have a windows computer that doesn’t already have Java SE6/Sun6, and I tried to download it but I’m not sure what I’m supposed to download… Is there a general download, or do you have to download multiple specific kits? I meant to say mac computer, jeez. Unfortunately I don’t have a Mac, so I can’t give any specific advice here. I’d recommend googling around for some tutorials on it. JRE to Run , JDK is to make. uhh, SE, probably. EE is special. If you go here: https://www.java.com/en/download/manual.jsp there is only one for Mac. Req’s Lion 10.7.3, mine (10.5) came with, so it was probably 10.7 that didn’t. So that’s the one. Apple vets Java for Mac, so on occasion, it is really far behind the windows one, but you’ll get updates through Apple’s Software Update. how do you make both towns and cities? Oh, that’s weird. Is it still happening now? Might have been a weird net issue. I have Java installed to the latest version, but it still doesn’t say i have it on my computer.No other earlier versions are in the folder and it just won’t let me play! Also, I will have a version of the game out later that does not require java to be installed. Thats my error. Strange, in the past it worked fine. Can you also include the lines which indicate which versions of java JRE & plugin are running? P.P.S Another java games work fine. Ah, so that’s pretty suspicious — you have different versions of JRE and Java plug-in. On my system it’s java plugin 10.7.2.10 and JRE 1.7.0_02-b10 — the important thing is that they both 7x. I would try java uninstall, reboot (yes, that’s important for java or it almost certainly won’t work), java install, reboot, launch game. Robby, you are the best person in the world, thank you for creating such an awesome game and helping people to play! IDK where to post bugs, but that’s my problem. Now thats the time I need it to link Temple of Infinity with towns of my friends. Hello there! I’m really wanting to play your wonderful looking game but when I go to start it up it says “Inactive Plugin” I’m running it in Chrome on a MacBook Pro, help? What exactly do you see when it is attempting to load? Just trying to figure out which step it is getting stuck on. Can you send me an e-mail or forums PM with exactly what happened?